The level of a liquid such as water or oil in a tank or vessel can be measured indirectly by means of the hydrostatic pressure of the so-called “liquid column”. The hydrostatic pressure under a static liquid column increases directly with the height of the liquid column. Thus, for example, the pressure in a water tank becomes 100 mbar higher, compared to the pressure on the water surface, for every metre of water depth. To measure the hydrostatic pressure, so-called submersible transmitters or level probes, have been especially designed for this purpose. 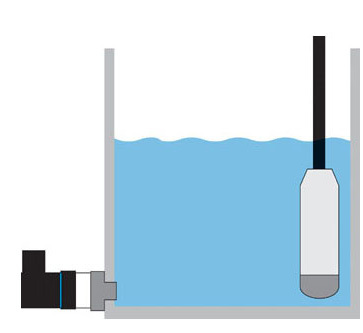 Submersible transmitters or level probes are pressure measuring instruments which are submersed into a liquid to measure the pressure prevailing on the bottom of the tank. An alternative is to mount a conventional pressure measuring instrument as close as possible to the bottom on the exterior of the tank. Both ways, the prevailing hydrostatic pressure and therefore the level or contents of the tank derived therefrom can be measured. More information on this subject can be found in this book: References: Eugen Gaßmann and Anna Gries: Electronic Pressure Measurement – Basics, applications and instrument selection; Süddeutscher Verlag onpact GmbH; Munich 2009 (Volume 323 of the series “Die Bibliothek der Technik” (library of technology).